Pronounced “kee-oh-gee-ya.” Chioggia beets are also known as Candystripe Beets and Bulls Eye Beets for their red and white alternating rings. After cooking, the flesh turns completely pale pink, which is why it is preferred in its raw form. It matures very early and has a mild flavor, and so requires less cooking time than most varieties of beets. Refrigerate beets in a perforated plastic bag, separated from the greens, for up to three weeks. Leave the beets unwashed when storing. When cutting the tops from beets, leave at least 1/2 inch of the stems and at least two inches of the tap root on the beet. If you cut closer to the beet, the color will bleed from the vegetable during cooking. Remember, greens will only last for a few days in the refrigerator so use them within two or three days. Choose small or medium-sized beets whose roots are firm, smooth-skinned and deep in color. Smaller, younger beets may be so tender that peeling won't be needed after they are cooked. Cut the majority of the greens and their stems from the beet roots, so they do not pull away moisture away from the root. Leave about two inches of the stem attached to prevent the roots from "bleeding." Do not wash beets before storing. Place in a plastic bag and wrap the bag tightly around the beets, squeezing out as much of the air from the bag as possible, and place in refrigerator where they will keep for up to 3 weeks. Be gentle when washing beets as you do not want to break the skin which will allow nutrients to escape. When trimming, leave at least an inch of the leaf stems attached and do not remove the root. As for the beet greens, wash greens in several baths of cool water to make sure all grit or sand is gone. You want the thin skin to remain intact for cooking. Although beets can be eaten raw, they are generally boiled, baked, steamed, fried, grilled or otherwise cooked before eating. To retain nutrients and color, boil, bake or steam without peeling first. The skin will easily rub off under cold running water after they are cooked. The stem and root are removed after cooking. For best flavor, bake beets instead of boiling or steaming and wrap them in foil to avoid staining. - Grate raw beets for a delicious and colorful addition to salads or decorative garnish for soups. pleasing both the eyes and the taste buds. - Sauté beet greens with other braising greens such as chard and mustard greens. - Marinate steamed beets in fresh lemon juice, olive oil, and fresh herbs. Cook beets lightly. 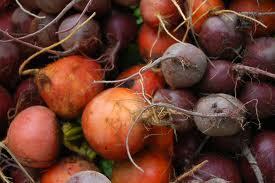 Studies show beets' concentration of phytonutrients, such as betalains, is diminished by heat. We recommend healthy steaming beets for 15 minutes to maximize their nutrition and flavor. Fill the bottom of the steamer with 2 inches of water and bring to a rapid boil Add beets, cover, and steam for 15 minutes. Beets are cooked when you can easily insert a fork or the tip or knife into the beet. Beets' color can be modified during cooking. Adding an acidic ingredient such as lemon juice or vinegar will brighten the color while an alkaline substance such as baking soda will often cause them to turn a deeper purple. Salt will blunt beets' color, so add only at the end of cooking if needed. The following nutrition information is for one raw beet (82 grams). Beets are also an excellent source of folate and a very good source of manganese, potassium, and copper. They are also a good source of dietary fiber, magnesium, phosphorus, vitamin C, iron, and vitamin B6.